On several occasions, particularly on the periphery of the Habsburg Empire during the 17th and 18th centuries, dead people were suspected of being revenants or vampires, and consequently dug up and destroyed. Some contemporary authors named this phenomenon Magia Posthuma. This blog is dedicated to understanding what happened and why. But then I went to see 18 St. Leonard's Terrace in Chelsea where Stoker lived. A plaque commemorating Stoker and Dracula was placed there in 1977. It overlooks a members only park and the Royal Hospital in a very nice and quiet area. If anyone should want to move to London, a few houses around the corner (on Royal Avenue just off Kings Road) are for sale or to let, but I suppose the price is a bit steep. De Masticatione Mortuorum for sale! 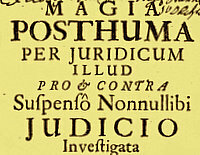 Magia Posthuma is the title of a book written by the Catholic lawyer Karl Ferdinand von Schertz in 1704. In the book von Schertz examines the case of a spectre that roamed about and harmed the living. Several of these cases were known in Moravia where von Schertz published his book, as well as in neighbouring areas. Only two decades later, a similar case was investigated by Austrian officials in North Eastern Serbia. The local people called the spectre a vampire. This incident inspired the deacon Michael Ranft to publish a study on the mastication of the dead. Just a few years later, in 1732, another case of vampirism was investigated in Serbia. Reports of this investigation were published throughout Europe with the consequence that the interest in vampires exploded. Vampires became the topic of numerous learned articles and books. Cases of magia posthuma or vampirism, however, kept occurring. In 1755 empress Maria Theresa aided by her court physician Gerard van Swieten began passing laws against the exhumation and destruction of corpses as well as other acts of superstition. Within decades, however, vampires caught the imagination of poets and authors of gothic fiction. Subsequently popularized by Bram Stoker in his 1897 novel Dracula and numerous movies, vampires have become part of everyday modern mythology, but the historical and cultural background has not yet been fully explored and understood. In fact, the modern conception of the vampiric count bears little or no resemblance to the revenants of the 18th century, and several modern books rather obscure than enlighten us on the early modern European revenants and vampires. This blog is an informal and personal contribution to the enterprise of exploring and understanding what happened and why.